It's not my place to go telling you all out there about my problems (unless they have to do with TV), but I do have a point to this. Currently, I'm going through what people euphemistically refer to as a period between careers, when what they really mean is that someone is unemployed. Anyway my current temporary assignment allows me to wear headphones while I work, which has enabled me to listen to David Von Pein's remarkable long-form audio from Cincinnati's WLW radio: 33 hours, documenting the broadcast days of November 22 and 23, 1963. The significance, of course, is obvious: the JFK assassination. But while that continuous coverage is interesting, what most intrigues me is what comes before the first bulletins are broadcast, a little after 1:30 p.m. ET. To all appearances, November 22, 1963 was an absolutely ordinary day—it's only in retrospect that the sheer ordinariness of it all is apparent; at the time, nobody would have given it a thought, which is what makes it so engaging. And the most outstanding example of that is a live, 90-minute program which airs five days a week and is simulcast on WLW radio and WLW-T television, called The 50-50 Club, hosted by Ruth Lyons; you might recognize it from some of the Cincinnati-area TV Guides we've looked at. It has been said that history swallows up the ordinary folks, but the preservation of this particular program—the television version of ordinary folks, as it were—simply by circumstance, gives us a wonderful snapshot of its time, from popular music to an economy built around, and advertised to, the vast majority of women who stayed at home raising their children. It is an example of ordinary folks telling the history. In 1957, Cincinnati mayor Charles Taft, proclaimed "Ruth Lyons Day"; WLW-T received 100,000 requests for tickets. 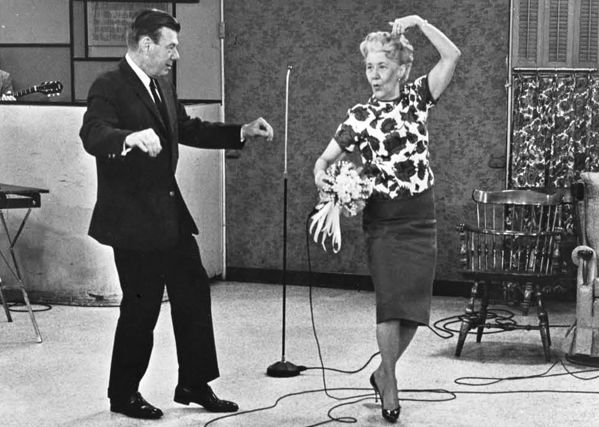 The 50-50 Club was the top rated daytime television program in America from 1952 to 1964. I'd call that a pretty fair legacy, wouldn't you? *And even those who didn't, such as Henry Cabot Lodge, Oscar Robertson, Adela Rogers St. Johns and Hedda Hopper. If you were in Cincinnati for any reason, you were on with Ruth. On the show of November 22, Lyons talks about Troy Donahue, who had just recently appeared on the show and had dined with the family. She and her daughter Candy were very impressed with him; he was a nice young man, and he seemed genuine. This day's audience contains members of a "Twins Club"—women who'd given birth to twins; another group present is called the "Secret Sisters Club." One woman in the audience has 12 children, ages two to 20, and hardly looks old enough for that to be possible. The show is in the midst of its Christmas Fund drive, Ruth Lyons' lasting legacy, raising money for those toys that Bob Greene wrote about, distributed to hospitalized children during Christmas. (At this point, the contributions were in excess of $160,000.) Everyone in the audience donates, and then they sing "Do It Now" (to the tune of "Frère Jacques"), urging viewers to make their contributions "for the little children." Sponsors donate prizes—pretty nice ones, in fact—for a drawing that will be held the following Thursday, Thanksgiving Day, from all those people who'd contributed to the Fund. 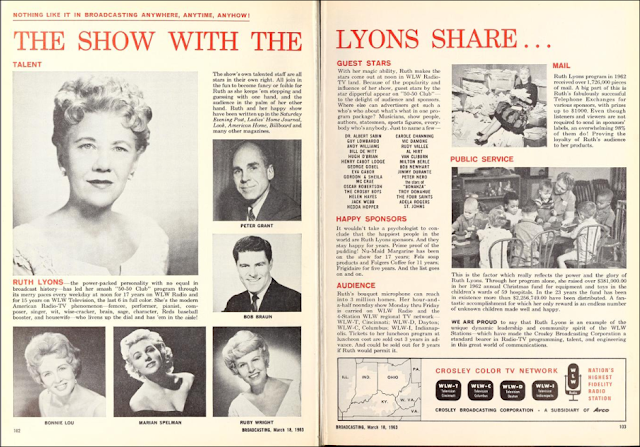 We find out that Lyons is a big fan of Cole Porter, whom she calls one of America's greatest songwriters (Porter is still living at this point; he doesn't die until August, 1964), and Porter's songs factor significantly in an interactive segment she conducts with the audience. There are other songs and games, and everyone has a good time; your ticket to the show specifies the date, and so it's completely by chance that audience members are part of the November 22 program. The 50-50 Club was the last regularly scheduled program that aired on WLW radio that Friday, in its customary noon-1:30 p.m. timeslot. Shortly thereafter, just as the afternoon program "Tune Time" was to begin (on tap: the original cast recording of "Lil' Abner"), a bulletin came into the WLW newsroom with the first details of an unknown sniper firing three shots at the presidential motorcade in Dallas, Texas. A subsequent bulletin from WLW features a couple of technicians speaking in the background; it would have been hilarious had it not been so traumatic. Kennedy's been shot, one man says, to which the other replies, the President ? (It could have been his brother, the Attorney General, targeted by an angry henchman of Jimmy Hoffa; but his time had not yet come.) After that, Ruth Lyons and her Christmas Fund and the upcoming drawing on Thanksgiving day are about as far away from your mind as you can get. Cincinnati mourned Lyons' death in 1988; here's the story as it was broadcast on Cincinnati's WLWT. It's ironic, don't you think, that one of the anchors on WLWT's news is Jerry Springer? There are tributes to Ruth Lyons, features on Ruth Lyons, highlights of The 50-50 Club. But nowhere online do I see a copy, audio or video, of a complete show, except for this one. I'm sure that neither Lyons nor anyone else appearing on that show thought anything of it, imagined anything significant about it, had no reason to think that this particular show would live forever as a testimonial to a 21-year run. But when you think about it, this wasn't just any show—because of the timing of the news bulletins, we hear the entire program; because Kennedy's assassination occurs in November and not, say, April, we hear the campaign for the Christmas Fund. What a fascinating piece, Mitchell. I was not familiar at all with Ms. Lyons prior to this. I look forward to watching this show. What's most fascinating about this is 1) we wouldn't even have this audio recording had it not been for the fact that the show was simulcast on radio and TV; and 2) I hadn't realized just how interesting it would be to listen to everything that happened before the bulletins started. When you've listened to about six or seven hours of it, you get so much into the rhythm of the day, you're a bit startled yourself when the first flash comes in. People mention "Friday, November 22" with no clue that it will soon be as famous a date as "Sunday, December 7." It's kind of like watching the replay of an entire historic sporting event, rather than just the highlights - the context becomes everything. You can find the same thing, to a degree, with a lot of videos from September 11th, although they're usually cropped to near the incident itself, you can hear the importance growing over time, especially on non-New York based broadcasts that just start with "Oh, there was a plane crash in NY, here's the traffic." I noticed that - listening to the radio in Washington, it takes them awhile to understand the scope of what's happening, and of course they have no idea that there's an attack on the Pentagon coming. Looking at the TV obit for Ruth Lyons, and then linking to the memorial show. Being a Chicagoan, my only knowledge of Ruth Lyons came from the obits I saw years ago for a face I grew up watching here - who came to Chicago after being Ruth Lyons's sidekick in Cincinnati in the early '50s. Look at the vey early pictures and you'll see a portly, smiling gentleman standing nearby. That's Frazier Thomas - "Fat, Friendly Frazier" as he often called himself - who moved to Chicago circa 1951, and became a much beloved figure here for more than thirty years. Thomas started out with Petticoat Party, a similar show to the Lyons program, along with a seminal Kid Show, Garfield Goose And Friends, which became his signature show. Frazier Thomas passed away in 1985. WGN Radio and TV, his broadcasting home in Chicago, marked the occasion with local specials, on which we got to hear a poem he wrote in his early radio days in the '40s. I just found a really bad recording of "I've Heard You On The Air" on YouTube; it's from a radio tribute by Chicago Eddie Schwartz from '85, and I call it to your attention here because - well, because I want to. I still don't know how to link, so you're going to have to find it yourself.